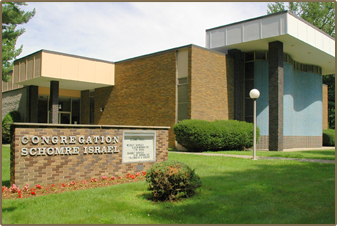 Welcome to Congregation Schomre Israel, a modern orthodox synagogue located in Poughkeepsie, New York in the scenic Mid-Hudson Valley. To see the shul's mission statement click here. On July 14th the shul is planning a bus trip to the Jewish Heritage Museum for the Auschwitz Exhibit. This trip is open to the community. For more details click here. Click here to see the Museum write-up regarding the exhibit. Once again Sisterhood will be selling centerpieces for your holiday table. Please click here for more details and ordering information. Rabbi Langer's weekly Tuesday classes continue at 10:30 am and his Thursday classes at 7:00 pm. The upcoming classes are here. To listen to classes already held click here. The shul is offering weekly classes in Chair Yoga, taught by Toni Farkas, on Monday mornings from 11:30am-12:30pm. The classes are open to the community and there is a nominal fee of $5 per class. If you have any questions please call the office at 845-454-2890. * The Sisterhood of Schomre Israel is providing breakfast food(cereal and bananas) to the local homeless shelter once a month. If you would like to assist the Sisterhood by providing four boxes of cereal for a specific month, please contact Sandy Corwin at 845-452-2436. *The shul's K4 Men's Club meets the last sunday of each month at 9:30am. If you have any questions please contact Steve Spira via the shul's office at 845.454.2890. * Bingo is played every Wednesday night at 7:00 pm. Doors open at 4:00 pm. * The Private Herman Siegel Post 625 of the Jewish War Veterans of the United States holds its monthly meeting on the first Sunday of each month, at 9:30 am at the shul. For more information please contact the Post Commander, Robert L. Morrison at robl56@aol.com. The Sisterhood's annual Purim dinner was held on Thursday, March 21st . The Sisterhood recently completed baking hamentashen for its 36th annual sale. Shown below are some of the bakers. Dr. David Luchins was our Scholar in Residence during the weekend of October 26-27. Details about his presentations are in the flyers here and here. This year's Jewish Heritage Night at the ballpark was held on Sunday, August 19th. The annual raffle and cocktail party was held on June 24th. The shul's annual Purim Dinner was held on March 4th. Pictures from the dinner are in the photo album section. Once again the Sisterhood baked and sold hamentashen as a fund raiser. Shown below is the last batch of hamentashen baked for the year. A total of 9650 were made this year. The next to last movie in our Saturday night at the movies series was on Saturday, February 10th at 7:30pm, with the movie being "The Producers". Sunday, January 14th at 7:00PM a presentation was made by Sibyl Silver on her project to rescue Torahs taken during World War 11. Click here for more details. This presentation was underwritten by a grant from the Ann and Abe Effron fund, under the auspices of the Community Foundation of the Hudson Valley. The shul's annual chanukah dinner was held on Sunday, December 17, 2017. On Sunday morning, September 3rd the shul hosted a breakfast and presentation by Hanoch Teller. Hanoch Teller is a globe-trotting modern-day maggid (storyteller of yore) renowned as the King of the Storytellers and will be speaking on "Heroic Children," his latest work. The book which is being called the next Ann Frank, represents every stripe of a young Jewish victim, from every corner of Europe and from every religious, national and socioeconomic background. What they all shared in common was an iron will to live - but not at all costs. Their determination to hold onto their dignity and principles make these unforgettable stories a zenith of human achievement. Heroic Children is a work of prodigious scholarship and spellbinding narrative. On Sunday, August 13th Schomre Israel sponsored "Community Jewish Heritage Night" at the ballpark. The party was held on june 29, 2017. Click here for pictures. The shul's annual raffle was held on June 25, 2017. The annual Purim dinner was held on March 12th. For pictures from the dinner please click here. The Sisterhood's annual Chanukah dinner took place on Sunday, December 25, 2016 . For pictures from the dinner click here. Shown below is Srully Wulliger performing at the dinner. Schomre Israel had a bus trip to lower Manhattan on Sunday, October 18th. We visited the Jewish Heritage Museum for a guided tour, followed by a guided tour at Kehila Kedosha Janina Synagogue & Museum. Pictures from the trip here. Video clips here. Support Shul's fund raising by Buying Gift Cards/Scrip. Order here or contact Leonard Grosman at (845)471-5105. The current weekly email newsletter is available here. To subscribe to the newsletter click here. Click icon to shop at Amazon and support the shul's fundraising. ​Support the shul's other fund raising while you shop online. Click here to start. Shop at Artscroll by clicking on the icon. Click on the icon to go to the organizations shown.